The profiler can optionally record object allocations, that is, track method call stacks where objects are created. Memory snapshots captured when allocations are being recorded contain allocation information. If an object was created when allocations were not being recorded, or recording was stopped at least once after the object had been created, snapshot will contain no allocation information for that object. 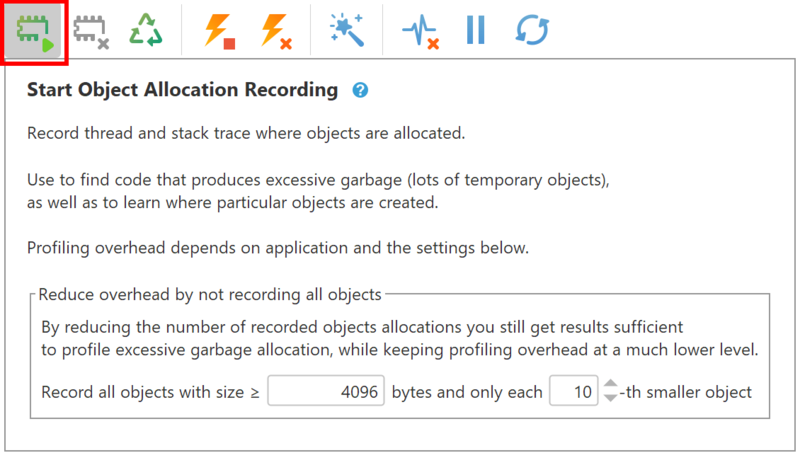 Due to performance considerations, object allocation recording is not always enabled. You should explicitly enable it when starting your profiled application. With object allocation recording enabled, even if allocations are not actually being recorded, there is some overhead to the application being profiled. The overhead depends on the number of created objects; in most cases it is not significant (less than 3-5%). In some cases, it may be useful to immediately start object allocation recording as soon as profiled application starts. Please find corresponding option on the Welcome screen. Allocation telemetry is available when allocations are being recorded. However, it provides only basic information. For comprehensive analysis, capture a memory snapshot (see below). Capture memory snapshot for analysis of recorded allocation information. If you capture a performance snapshot instead, only allocation telemetry will be available. You can start and stop object allocation recording during execution of your application as many times as you wish.